A stay at Rembrandt Hotel Suites and Towers places you in the heart of Bangkok, within a 15-minute walk of Soi Cowboy and Terminal 21 Shopping Mall. 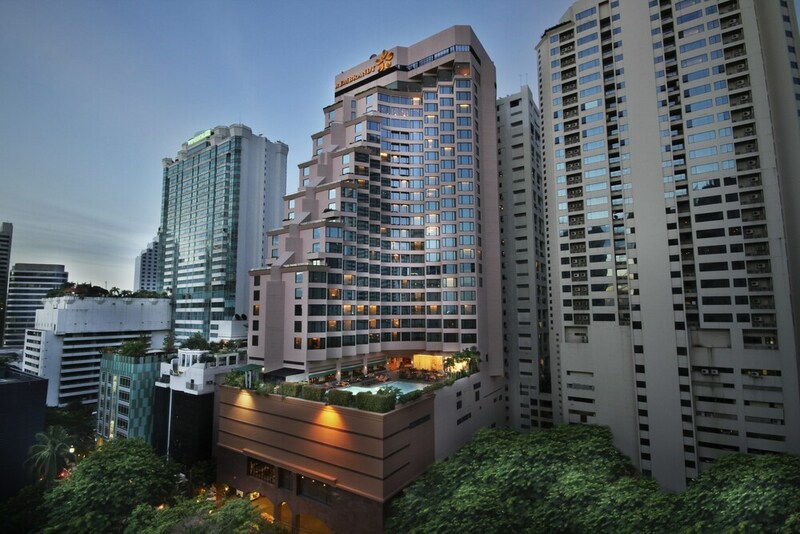 This 4.5-star hotel is 0.7 mi (1.2 km) from Emporium and 1.9 mi (3.1 km) from Erawan Shrine. Make yourself at home in one of the 407 air-conditioned rooms featuring refrigerators and LCD televisions. Satellite television is provided for your entertainment. Private bathrooms with showers feature complimentary toiletries and hair dryers. Conveniences include phones, as well as desks and a turndown service. Take advantage of recreational opportunities offered, including an outdoor pool, a sauna, and a fitness center. Additional amenities at this hotel include complimentary wireless Internet access, concierge services, and gift shops/newsstands. Guests can get around on the complimentary shuttle, which operates within 200 km. Enjoy Indian cuisine at Rang Mahal, one of the hotel's 4 restaurants, or stay in and take advantage of the 24-hour room service. Relax with a refreshing drink from the poolside bar or one of the 2 bars/lounges. Buffet breakfasts are available daily from 6 AM to 10:30 AM for a fee. Featured amenities include limo/town car service, a computer station, and express check-in. A roundtrip airport shuttle is provided for a surcharge (available 24 hours), and free valet parking is available onsite. In addition to an outdoor pool, Rembrandt Hotel Suites and Towers provides a sauna and a fitness center. Dining is available at one of the hotel's 4 restaurants. The property also offers a snack bar/deli and a grocery/convenience store. Guests can unwind with a drink at one of the hotel's bars, which include 2 bars/lounges and a poolside bar. A computer station is located on site and wireless Internet access is complimentary. This luxury hotel also offers spa services, a terrace, and tour/ticket assistance. An area shuttle within 200 km and a shopping center shuttle are complimentary for guests. Onsite self parking and valet parking are complimentary. Rembrandt Hotel Suites and Towers has designated areas for smoking. Rang Mahal - This restaurant specializes in Indian cuisine and serves brunch and dinner. Reservations are required. Open daily. Mexicano - This restaurant specializes in Mexican cuisine and serves brunch and dinner. Guests can enjoy drinks at the bar. Reservations are required. Open daily. Red Pepper - This restaurant serves breakfast only. Open daily. Da Vinci - This poolside family restaurant specializes in Italian cuisine and serves brunch and dinner. Guests can enjoy alfresco dining (weather permitting). Open daily. 1826 Rooftop Bar - Onsite rooftop bar. Open daily. This property offers transfers from the airport (surcharges may apply). Guests must contact the property with arrival details before travel, using the contact information on the booking confirmation. Reservations are required for massage services and spa treatments. Reservations can be made by contacting the hotel prior to arrival, using the contact information on the booking confirmation. A resort fee is included in the total price displayed. One child 11 years old or younger stays free when occupying the parent or guardian's room, using existing bedding. No pets and no service animals are allowed at this property.